When I had my first baby, I was determined to make all of his baby food myself. But I really didn’t know what I was doing and got overwhelmed fast. I was buying lots of fresh organic produce that I had to wash, cut, cook, puree, and store. As a new mom, I already had my hands full and felt like produce was going bad before I had time to prepare it, or if I did prepare it my son was wasting most of it. I got so frustrated and overwhelmed that eventually I started buying store-bought purees instead. When my second baby was born, I did a mixture of purees and softer pieces of food (I wanted to dip my toe in baby lead weaning but was still a bit unsure and nervous about choking). With two kids at home and on more of a budget, I decided to give making baby’s food myself another go. But this time I did my research. I looked into what tools would work best, found recipe and food ideas, and figured out some shortcuts to make things easier. For example, I didn’t need to buy all of that fresh produce. Have you ever cut up a butternut squash!? Why not buy organic frozen fruits and veggies instead? Then all I had to do was steam them as needed and either cut up, mash, or puree depending on what it was and how I wanted to feed it to my baby. Now that baby number three is almost six months old and ready to start solids, I’m dusting off all of my old tools to start making food again. I do buy baby food at the store occasionally so that I have some on hand in a pinch or to let him try a new flavor before I make a big batch. But overall I’ve found that making your own baby food at home can be easier and cheaper than buying it at the store as long as you have the right tools. Here are fifteen things to consider buying if you want to make homemade baby food too. Chandra is a mom of three boys (8, 4, and 3) and the founder of Oh Lovely Day, a lifestyle blog with a honest look at motherhood. 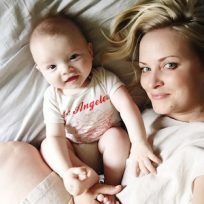 She is trying to create more of an open dialogue with a no-judgement attitude about the struggles of mothers, mental health, postpartum depression, breastfeeding, baby wearing, and just doing the best we can and not being too hard on ourselves. In that vein, she started the hashtag #battlefieldmotherhood to encourage her fellow mothers to share on Instagram as well. She believes in dance parties, desserts during nap time, and a good hike can cure almost anything. And someday she hopes to sleep and date her husband again. You can also find Chandra on Instagram, Pinterest, and Facebook.